By lavender at Dec. 16. 2016. The Down to Earth Garden Club will be wrapping gifts at the DuBois Mall from Friday, December 18 through Christmas Eve. The group will be there from 10 a.m. (or earlier) until 9 p.m. every day and until closing on the 24th. The station will be along the main corridor near General Nutrition Center. There are some very special surprises this year. The gorgeous bows are again available and Santa has provided coal for those who have been naughty. Gift- wrapping is for a donation. All of the proceeds go to fund the many landscapes and plantings throughout the city that the group cares for. These include, among many others, the DuBois Public Library, the Beaver Meadow Walkway beds and the City Building. In all the group plants and maintains over a dozen separate locations in the DuBois area plus a butterfly teaching bed at Parker Dam and one on the Beaver Meadow Walkway. A pollinator garden near the Penn State campus is an ongoing project. The club also provides public service programs in the DuBois area. Members are involved in seminars at the DuBois Library, gardening help programs and sessions for children. Assistance for achieving Scout badges is also available through the organization. 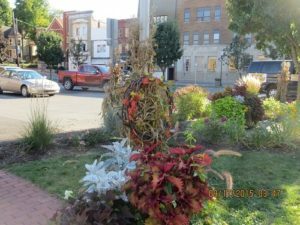 The Down to Earth Garden Club promotes the benefits of gardening and keeps DuBois beautiful drawing on the expertise of members with both experience and education in multiple fields. « « Why Won’t my Roses Bloom?